Standing 6’2″ in his custom suit, wearing bright new kicks, Jay Baer is a hard man to miss. Oh, and the fact that he’s usually surrounded by a mob of fans also makes it hard for him to hide. Jay Baer has become the poster child of marketing thought leadership over the past few years, and for good reason: He’s an actual, genuine, marketing expert in a world where “expert” is an over used title. But Jay’s panache isn’t what makes him great—it’s his work ethic and genuine love for his craft that produce his status. I found this genuine love for the craft of marketing to be a common thread among marketing experts while I was researching and creating the new list of 103 Genuine Marketing Thought Leaders. I noticed every person on the list had a passion for marketing driving them to explore, push the bounds, and do what marketers do best: be creative. For these marketers, “being creative” means everything from using comics to sell enterprise software (Tom Fishburne, #2) and blowing up the idea of branding (Cindy Gallop #9) to understanding the connection between doorknobs and white papers (Donald Norman #8). Ideas from these passionate marketers are changing the face of marketing and how it is executed. 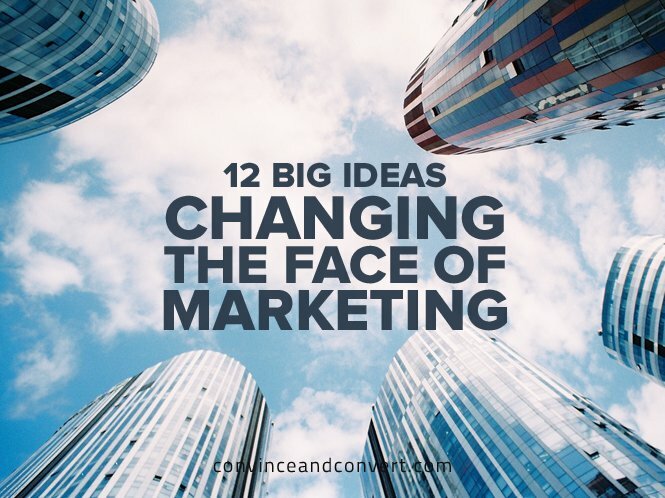 Here are 12 of those big ideas changing the face of marketing. Jay Baer dresses in his own style. Joe Pulizzi hosts Content Marketing World in his hometown of Cleveland. Cindy Gallop fights for equality for women in the advertising world. You will see genuine actions in each and every thought leader, and in their work as well. If your marketing isn’t genuine, there is no way it can ever be great. I met Tom Fishburn over email a few years ago after coming across his comic series for Kronos. Humor is not a new concept, but using humor to market things such as enterprise software or financial services very much is. The idea that your customers don’t have a sense of humor is false. Everyone laughs, and bringing someone joy should be a focus of all brands in all of their efforts. Humor is a great way to do this. Doc Searls and Don Peppers both co-wrote best selling books in the 1990s, yet they’re still prolific today. On the list of 104 thought leaders, there are plenty with grey hair—this for an industry who usually thinks only the young, hip, and counter-cultural can speak the language of the new generations. Marketing isn’t just about sharing traits with your audience—it’s about learning to communicate with them. Learning is essential to marketing, and learning never stops. If you stop learning, your marketing will stop improving. Gary Vaynerchuk is a master marketer. Many people may not know that he got his start by marketing his own family business. He took it from a few million in revenue up to over $40 million in revenue in just a few years. His marketing tool of choice? YouTube. He didn’t waste time with direct mail, email, or local billboards. He knew where his market was, how he could help them, and then did it. Learn to market in the era you live in, not the one you went to school in. Today, there are hundreds of thousands of people on LinkedIn with titles like “Ninja,” “Guru,” and “Growth Hacker.” In reality, there is only one marketing ninja: Chris Penn. He is a legitimate ninja, and to our knowledge, he is the only one. Shameless self-promotion and blatant lies dressed up as “creativity” are still shameless, self-promotional lies. Marketing must be honest. Irreverence is not vulgar, rude, or insensitive—it is simply disregarding the status quo. When you hear people like Scott Stratten, Travis Wright, and Andrew Davis speak, you light up inside. You feel excitement again for your job and begin dreaming again about new possibilities. Their use of irreverence in talking about marketing is what your marketing needs. Break free from what you used to do, what you used to think marketing was, and what you think your brand can be if you want your brand to light up your customers like they do their fans. What does a doorknob have to do with marketing? Everything, if you are talking to Donald Norman. His break-out book, The Design of Everyday Things, looks at simple objects to understand why they are so powerful and how to translate this knowledge into the design of everything. We must remember our white papers, websites, and experiences are usually not designed for ease of use, or for optimal results, but rather lead generation. Remember everything you produce is designed, and if you fail to put any thought into the design, it will fail you. His words will change the way you design everything. Cindy Gallop is one of brightest minds in advertising. She formulated a new type of branding called Action Branding for Levi back in the early 2000s. Her formula of “Shared Value + Shared Action = Shared Profit” has been studied by Harvard and is taught in their case study series. Branding is not about what you do or say—it’s about all of your touch points aligning with your customers values. Brand is no longer just in marketing’s hands. What is the ROI of an email? This is a trick question. There was no cost to send the email, and for most businesses, email is not a direct tie to revenue. Measuring something based on revenue when there is no revenue before or after it seems a bit silly. Gary Allen, author of Measuring the Digital World, understands this issue better than most and teaches the need for “models, not metrics.” Models are predictive, can tell you future outcomes, and identify issues before they occur. Metrics are just flashing red lights telling you there is a problem. David Ogilvy said, “The customer is your wife,” when referring to his disgust in how marketers talked down to their customers, whether it was with dishonest messaging, downplaying consumers’ intelligence, or trying to outsmart them with copy. Now that all marketing is one-to-one, you must treat each person as an individual and realize your mass marketing tactics do not work in one-to-one scenarios. You can’t out smart a customer with email copy, and you can’t make someone click by hiring a big name to put on your webinar. Customers are just as smart as you, and many times, smarter. Robert Scoble isn’t a marketer—rather, he’s a futurist. He was one of the world’s premier bloggers, and now he is one of the world’s foremost experts on the future of tech. When you see what he is playing with and the people pushing the bounds of what is possible, you begin to see we are just at the beginning of the new marketing frontier. It will never slow down, and it’ll only become more dynamic as time goes on. Failing to prepare for the future is preparing to fail. There are 103 names on the newly curated Marketing Thought Leader list, including all of those referenced in this article. Marketing thought leaders, marketing professors, and CMOs of leading companies collaborated to curate each name on the list. Each person was selected because they are respected by other thought leaders as experts in their field and have proven their status time and time again. Being a thought leader is constant work and not something to be taken lightly. It takes a genuine passion, expertise, drive, a different perspective, and the ability to break out of the status quo. Brands who are true thought leaders have these same traits and dedicate significant effort to going above and beyond. As a result, they are looked up to by their customers and fans. There is no shortage of ideas about marketing, but these 12 ideas changing the face of marketing come from some of the best minds in the industry and surrounding disciplines. Be diligent about where you get your information, and if you need help finding those genuine marketing thought leaders, there are great lists such as The 103 Genuine Marketing Thought Leaders to help you out. The future is ever-changing, and these minds will help accurately guide you to a better tomorrow.